Applications. The cloud. Streaming video. Keyword searches. Are these so-called perks of the digital revolution true rewards, or are they the 21st century's answer to Pong, VHS, and DOS? Given the ever-changing digital landscape and its expenses, is it worth bothering with the products and programs now being offered to the construction industry? It's true enough that a decade from now, devices and programs now considered cutting edge may be obsolete. But since digital technology is in a perpetual state of evolution, those who choose to wait until a "gold standard" is reached could be left behind in terms of reaching increased effectiveness and profitability with their construction firms. Look below to see how simply employing effective construction company software programs can enhance the ways in which your firm is doing business. 1. Good Software Packages Work For EveryoneThat's fabulous that your IT guru totally gets that new program, and that it's totally awesome on his computer. But he's not the only one who has to use it. A good software program is one that not only is easy to master and compatible with machines. It needs to have practical, real world applications that make a firm work more productively and save money. Daily reports are tedious but important documents. They are viewed in various formats by everyone from project managers to stakeholders. It's important that this data be legible, transcribed quickly, and available for viewing as soon as possible by numerous parties. Raken for daily reporting reduces transcription time by as much as ninety minutes daily, and allows multiple parties to view and edit this data in real time. 2. Software Improves On StorageAll of that paperwork is important, remember? It must be stored legally for years. Not only does stored paperwork take up a lot of room, it's vulnerable to loss and damage. 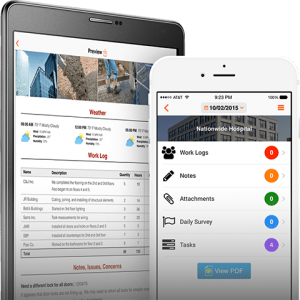 Project management software for construction like Raken uses a cloud platform to digitally store thousands of files safely for up to ten years. 3. Software Improves On AccessibilityAll those filing cabinets, and no idea which one holds the file for Project X? With software like Raken, that file can be located with a quick keyword search. Even better, that file can quickly be passed electronically along to appropriate parties with none of the delays and risk of loss caused by "snail mail". 4. Software Spells It OutOne reason those physical files are so "plump", is that multiple reports are included within them. A software construction company like Raken allows diverse reports to be saved in the same file, and separate elements to be easily incorporated into the same comprehensive report. With software like Raken, a single employee can now perform these tasks, freeing up time and resources to concentrate on other aspects of a project.